Linda Burton posting from Salt Lake City, Utah – “My daughter had her prom here,” our tour guide said as we stood in the rotunda of the Utah state capitol. There was an audible “ah” from our group as we gazed upward, 165 feet we were told, clear to heaven it seemed; clouds and seagulls soaring and floating in blue, blue sky. Imagine that! Girls in party dresses with flowers in their hair, boys in Sunday suits; dressed up and dancing on a glass-bottomed floor, lit up from below. Music in marble halls on top of the loveliest hill in town. It’s a party in the People’s House, just one of many events that happen here on a regular basis – proms, weddings, concerts, meetings; get-together for fun or for business, this building is open for your use. But back to that prom. The space is architecturally stunning; graceful marble stairways at either end, curves and arches, balconies and marble pillars. A chandelier on a 95-foot chain. And chaperones. Yes, the teachers are there, and some parents who were relegated to the scene. 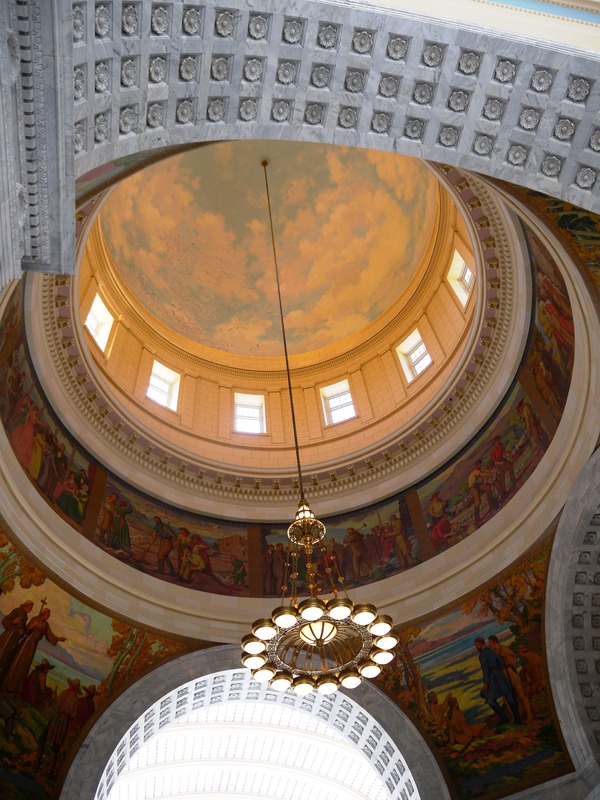 But I’m talking about the sculptures watching from the four niches surrounding the main floor. 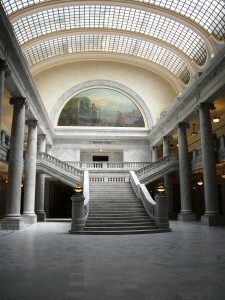 Designed to “inspire future generations,” they are called The Great Utahs and each one shows an adult mentoring a youth. 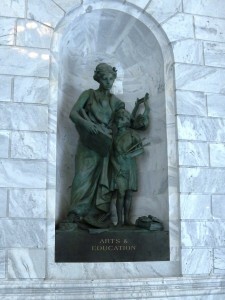 The arts and education composition in one corner depicts artistic and intellectual development; a lyre for music and poetry; two large books representing all human knowledge to be conveyed from past generations. The young girl holds an unfinished wreath, symbolizing unfinished potential. In the next corner the science and technology composition shows a young boy peering through a telescope – what does he see? What is yet to be discovered? 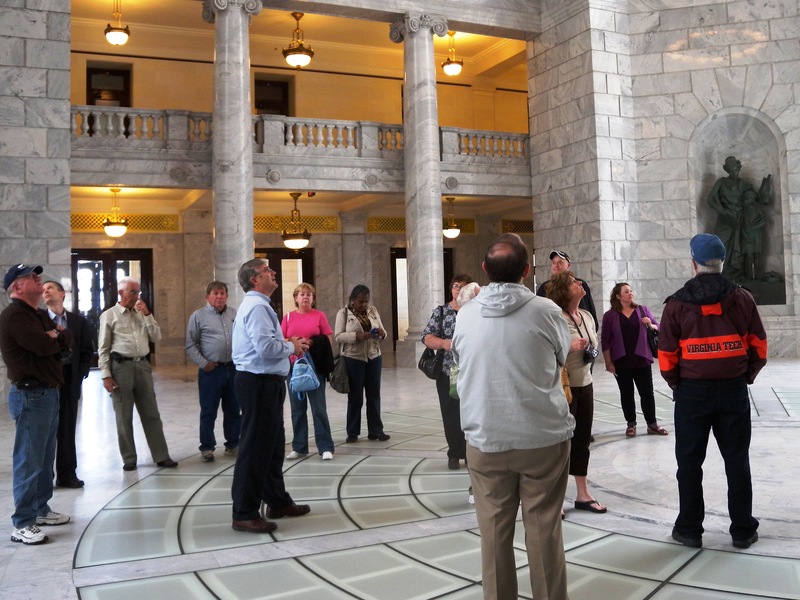 In the land and community composition youth is represented by a Rocky Mountain elk calf, the Utah state animal. The healthy calf beams with confidence, watched over by the wisdom of the community. And the fourth composition, immigration and settlement, shows a young girl holding the world in her hands, walking towards the future full of excitement, and expectation. Perhaps not even one of the prom goers notices, or thinks about the meaning that the artists had in mind when the bronze was cast, and the statues were carefully put into place. Classical allegory on prom night? Not a chance. But maybe some day they’ll come back to relive the memory of that prom, their little ones skipping along beside. And they’ll see those statues in the niches there, and the meaning of the artists will be clear. 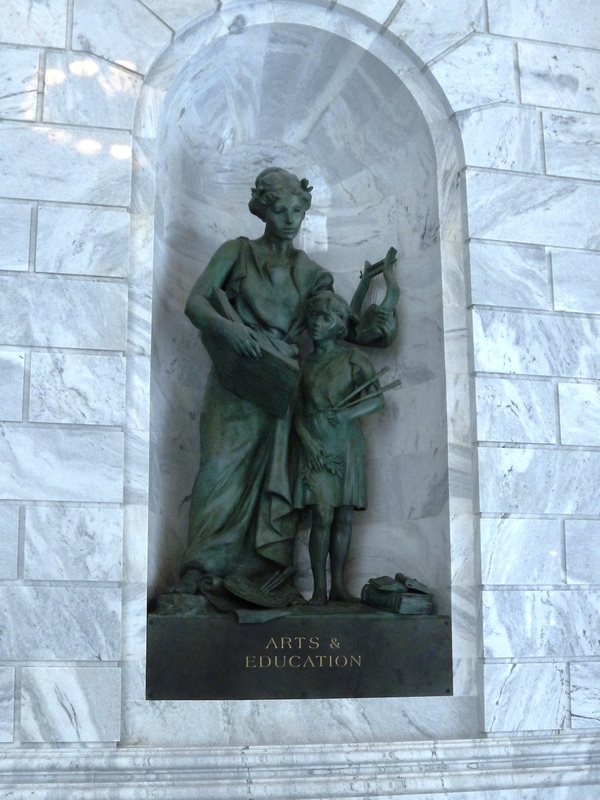 Those statues represent what every parent wants for their child, and in Utah, they have stated it in bronze. Prom night in the state capitol. A really smart idea. The Niche Sculptures are 11-foot bronzes created by artists Eugene Daub, Robert Firmin, and Jonah Hendrickson.